The Parkeology Challenge is the original and toughest Disney ride challenge: a theme park race against the clock! The objective is to ride all the open rides in a single operating day. At Walt Disney World, you must visit all 4 parks — Magic Kingdom, Epcot, Disney’s Hollywood Studios, and Disney’s Animal Kingdom. At Disneyland Resort, you must visit both Disneyland Park and Disney California Adventure. For the most extreme version of the challenge, you must wait for a day with no rides closed for refurbishment and then attempt to ride EVERY SINGLE RIDE in one single normal operating day. Register your attempt at least 48 hours in advance. Tweet a photo of yourself on every ride throughout the day. Walt Disney World provides free WiFi park-wide. If you choose not to send tweets, we are unable to consider your attempt. Missing an on-ride photo is the same as missing the actual ride. We must see photos on every ride! Taking and tweeting the photos is part of the Parkeology Challenge. You must use @Parkeology in every tweet. You must use #parkeologychallenge in every tweet. Tweet from each ride in the order that you ride them. A sample tweet might be “@Parkeology Ride 1 Space Mountain #parkeologychallenge” and include a photo of the team members on the ride. You must tweet a screenshot from the My Disney Experience / MaxPass app of any FastPass that you intend to use. Walt Disney World FastPass+ Advance Reservations – If you reserve up to 3 FastPasses prior to the day of your run, you must tweet the screenshots before your run begins. FastPasses acquired via app/kiosk during the run – You must tweet screenshots as soon as acquired, before using the FastPass. If a FastPass is modified to a different ride or return window, the modification must also be tweeted. If a FastPass is not used or canceled, we require a tweet notifying us of that fact. It may not be practical to tweet every ride at the moment it is ridden, but please make sure each ride is accounted for. If there are instances where photos are not practical (such as while riding a dark thrill ride), please snap a picture as you load or unload the ride vehicle. We need evidence that you are actually on the ride. Photos from outside the attraction, within the line, or by the sign are not valid. Some rides (such as Avatar Flight of Passage) do not allow photos while on the ride itself. In these special cases, a photo from the final pre-show room or just prior to boarding is acceptable. Please wear the 3-D glasses or include images in the photo clearly showing that you are within the attraction. It is understood that you may forget to send a tweet or that a tweet may not go out due to technical problems. In those rare cases please resend the tweet as soon as possible and please try your best to tweet as closely to the time you ride as possible. The day begins at the earliest posted opening time (including Extra Magic Hours) for any of the four parks. It ends with the latest posted closing time (including Extra Magic Hours). Park hours will vary. If a park is open past midnight, those late hours are considered to be a continuation of the previous day’s operating day. Special AP or DVC restricted events. Any additional hours provided outside of normal park hours and the Extra Magic Hours provided to guests staying at resort hotels. We take our list of rides from the official attractions listing on Disney’s website. If it moves, it’s a ride. Shows such as the Country Bear Jamboree or Great Moments with Mr. Lincoln are attractions but are not rides. Walt Disney World Transportation such as the Monorail, Ferryboat, etc. – These are outside the park and are transportation methods, not attractions. They are not part of this Disney challenge. Note: At Disneyland, the Monorail is considered an attraction, and therefore must be ridden to complete the Disneyland Resort version of the challenge. Epcot FriendShips – These are technically inside the park, but Disney considers them as transportation. They do not appear in the official Disney list of attractions and do not need to be ridden. What Constitutes “Riding” a Ride? You must ride the complete ride unless noted below or in certain on-ride breakdown situations. Walt Disney World Railroad: The ride lets you get on or off at several different stations. For the purposes of the Parkeology Challenge, riding any one of the railroad legs is sufficient. Main Street Vehicles: These come in several varieties — horse cars, omnibus, fire engine, etc. Riding any one vehicle is acceptable. You must ride until they stop and let you off. Mission: SPACE: You can choose Orange or Green team. Tom Sawyer Island: Ride the raft to the island and back. There is no need to explore the non-ride portion of the attraction. The Carousel, Main Street Vehicles or any other attraction that you could conceivably jump on, snap a photo, and jump off. You MUST ride the attraction. Jumping on and off only for a photo is cheating. Disneyland Railroad: The ride lets you get on or off at several different stations. For the purposes of this challenge, riding any one of the railroad legs is sufficient. Disneyland Monorail: This ride has multiple stops. You can choose to ride any one leg of the trip. Red Car Trolley: This makes multiple stops. You only need to ride one leg of the journey. You must ride until they stop and let you off. Pixar Pal-A-Round: You can ride either the swinging or the stationary gondolas. Holiday Overlays: We do not count the Holiday overlays to Haunted Mansion, Space Mountain, “it’s a small world,” or the Cars Land rides as separate attractions, even though the website lists them as such. Ride whichever version (normal or holiday) happens to be open. Pirate’s Lair on Tom Sawyer Island: Ride the raft to the island and back. There is no need to explore the non-ride portion of the attraction. King Arthur Carrousel, Main Street Vehicles or any other attraction that you could conceivably jump on, snap a photo, and jump off. You MUST ride the attraction. Jumping on and off only for a photo is cheating. Are You Allowed to Bypass Lines? You must follow the stated policy for these programs. Utilizing special “Use Anywhere” paper FastPasses that are sometimes issued by Cast Members as a “Magical Moment” or Guest Recovery. Taking advantage of technical glitches or breakdowns in the FastPass+ or MaxPass ride reservation system, that result in you obtaining extra FastPasses outside the normal parameters of the system. Violating park rules or general park etiquette, such as disregarding safety, deceiving Cast Members or other guests, or behaving in a disruptive manner. If you are holding an unused FastPass for an attraction and the attraction breaks down during your FastPass window, Disney will automatically convert your FastPass to a “Multiple Experiences” FastPass. This FastPass normally allows you to use it on a variety of alternate rides, or use the FastPass for the broken ride at any time after the ride returns to operation. We do allow you to keep your FastPass to use on the broken ride for which you originally scheduled the FastPass. Since this entitlement is automatically granted to all affected guests, this falls within the boundary of our challenge. We want to minimize an unfortunate incident that disrupted your plans through no fault of your own. We do not allow you to use the FastPass for an alternate ride. This is to prevent an unfair advantage in riding a more valuable ride that you were unable to secure a FastPass for during the regular course of operations. For example: If you are holding a FastPass for Big Thunder Mountain and it breaks down, you may keep the FastPass and ride Big Thunder Mountain with it at a later time in the day. However, you may not use the FastPass for Space Mountain, even though Disney’s system will entitle you to do so. No personal chauffeur between parks. You must utilize public transportation or something similar available to the average guest. Nobody can book FastPasses, monitor wait times, or offer informational assistance on your behalf. Teams are welcome to bring or purchase their own food, but no one else can fetch food or provisions for the team. No acting as a “runner” for FastPass kiosks. No “sitting out” a ride. We’re sympathetic that not everyone can handle every ride, but only by riding everything do you get credit. Teams may split up out of necessity for Single Rider lines or common sense things like going to the bathroom. Even though the following items are technically available to everyone, we consider them outside the spirit of the Parkeology challenge due to their limited capacity or rare circumstances. Utilizing hard-ticket events like the Mickey’s Not So Scary Halloween Party or the Christmas Party. These events limit capacity, which shortens wait times. The Early Morning Magic or Disney After Hours add-on package, which is essentially paying for Extra Magic Hour access. Marketing events like the 24-hour ‘Round the Clock operating hours. Utilizing additional Fast Passes purchased as a perk of staying on a “Club Level” at a Walt Disney World Resort Hotel. This is available to only a select few guests at a high additional charge. Utilizing advanced dining reservations for breakfast in order to enter a park early. This is available to a limited number of guests and would unfairly be a way to gain early access to attractions. Utilizing Club 33 FastPass benefits which are not available to the average guest. Riding Every Open Ride – Challengers are exempt from riding any ride that is under refurbishment or otherwise not scheduled to operate. 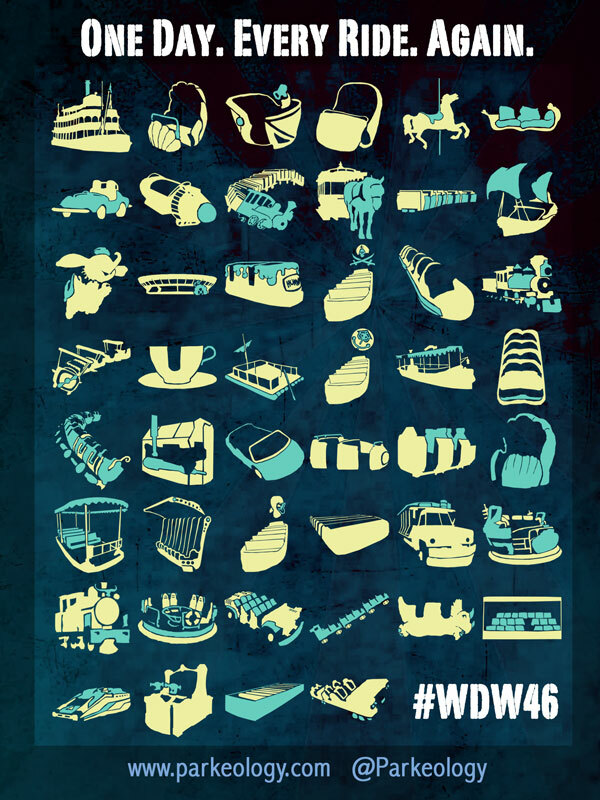 Riding Every Ride – All rides are operating and none are under refurbishment. This category is considered the highest difficulty and is honored as such on our tracking board. These closures may be for only a few minutes or may last all day. If a ride closes unexpectedly, you will have to adapt and hope that you will be able to ride it later. Otherwise you will not get credit for completion. There is also a special case involving breakdowns of FastPass rides (see above). No. You must ride every ride on the list. There is no credit for duplicates. What if a Ride Breaks Down While I am on It? We generally count the ride if you are physically in the ride vehicle when it breaks down. If you’re in line and it breaks down, we do not count it. You will have to come back and ride later. Park hopping takes time but is necessary in order to ride all the rides. Minimize it as much as you can. At Disneyland, the only park hopping allowed is on foot or via the Monorail. The Parkeology Challenge is similar to a marathon. The longer you have to complete it, the less challenging it becomes. The difficulty levels are based on the operating hours for the date of the attempt. 17 or fewer hours = Expert Difficulty. Teams must do everything in their power to limit attraction wait times and park hops, and must be able to maintain a brisk pace throughout. 18 hours = Advanced Difficulty. The extra hour provides a small cushion for a moderate pace and helps to offset some of the tight windows for ride closures. 19 or more hours = Moderate Difficulty. With this many hours, unplanned ride closures and large crowds are the main limitations. Teams may move slowly between attractions and even take breaks. * Note: The official park hours are what dictate the difficulty, not how long it takes to actually complete all the rides. If the park is open 20 hours and a team completes the Parkeology Challenge in 18 hours, we will still record it as a 20-hour attempt. This is because days with longer hours have different crowd flows and individual ride operating hours, which affects the final strategy. Completing all the rides in 18 hours during a 20-hour operating day is not the same as completing them on an 18-hour operating day. In order to keep things fair for everyone we have a separate category for challengers who use disability assistance passes. If you have a physical condition that requires the use of the pass, you may use it during the challenge but we will note it as a point of fact. I am planning a practice attempt, should I register with you? No, please only register attempts that you wish to be tracked and recorded on the official board. If you register with us the run will be considered official and listed regardless of the results. Of course you do! But we will warn you that you may not eat, you will be on your feet all day, it may be hot and insanely crowded. It’s the toughest Disney challenge out there. If you give it a shot, check out our Parkeology Challenge Sign Up page!